Kuban Krasnodar are not an uncommon story. In fact, going bankrupt and disappearing from Russia’s Football National League is hardly news. There have been many – Alania Vladikavkaz, Dinamo St. Petersburg and FC Novokuznetsk are all recent examples. Some manage to limp back (former league champions Alania now skulk around Russia’s third tier); some have tried time and again, but never got things working (I await yet another incarnation of Dinamo); others are represented in amateur football (Novokuznetsk). However, what is yet to happen is a club disappearing and then being resurrected by its fans and former players. FC Kuban Krasnodar are the first – they recently played their inaugural match as a reformed team just months after leaving the FNL. 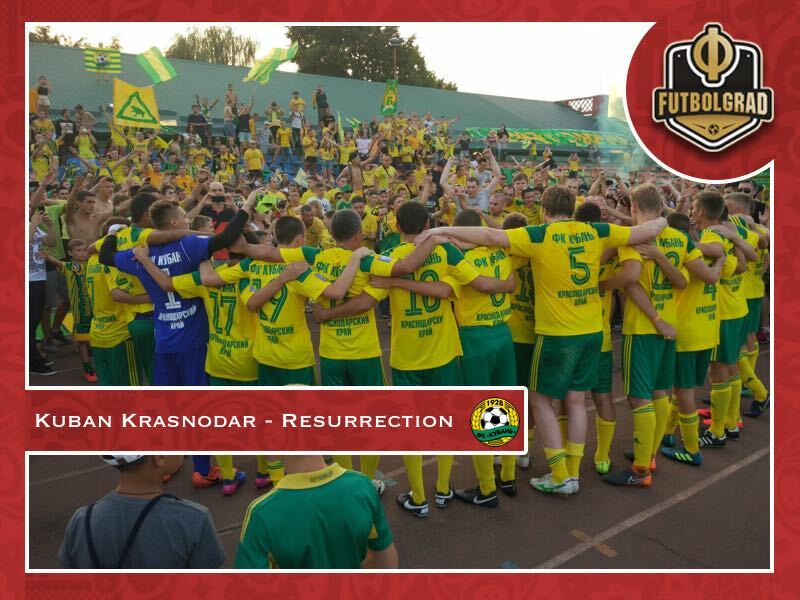 There are actually two ‘successor’ clubs to Kuban right now – a fan-created one and a regional government-created one. Soon after Kuban’s bankruptcy, Krasnodar Region vice-governor and club supervisor Andrey Korobka announced the formation of FC Urozai, sponsored by the same wealthy investor as Kuban was (Michel Litvak) and registered to play in the third-tier Professional Football League. Urozai also inherited many of Kuban’s ex-players and would like to get the name and badge back once this is allowed professionally in two years’ time. This is likely to prove difficult: Russian Business Consulting report that an attempt to reorganise Kuban just prior to bankruptcy was not completed, and as a result suggest there is no legal successor. Urozai or Nadezhda – Who is Kuban Krasnodar’s real successor? Fans in Kozmin’s group have been well-supported by ex-Kuban players. Player-coach and club legend Stanislav Lysenko has plenty of experience to offer – his amateur club, Nadezhda, is the base upon which the new Kuban has been formed. Lysenko has been joined by several other ex-Kuban players who’ve recently finished their professional careers: Artur Tlisov, Andrey Topchu and Andrey Ushenin. Around two thousand fans were at the Trud Stadium in Krasnodar to watch Kuban’s return match in the Governor’s Cup. Fortunate enough to get a YouTube link to the match, I sensed a real purpose and optimism at the event, right from the initial speeches from fans and club heroes alike through to the commanding performance on the pitch which saw Kuban’s blend of ex-professionals and young prospects run out 3-0 winners. There is also a new sense of unity amongst the club’s various fan groups – “If we had our differences before, then this year our plight has bonded us all. Now there is one task – the rebirth of Kuban,” Aleksandr Masalygin, leader of one fan group, told RBC. The current plan is for Kuban to play out the remainder of the Governor’s Cup tournament, then join a regional winter tournament. Before that, there is the small matter of getting their name back, which should happen at the end of August (officially at least, the club is still called Nadezhda). Unlike Urozai, the amateur status of Lysenko’s club means that using the name should not be an issue. Currently, Kuban’s overheads are small – players are appearing for free, and fans and local businesspeople seem ready to cover other costs. However, there is a recognition that things have happened quickly and that the club needs a stronger financial foundation if the ambition of returning to professional football is to be realised. Kuban are keen to attract small amounts of investment from numerous small investors, rather than find one rich investor who could leave the club high and dry – discussions with interested parties are apparently going well. There are also plans to set up a public association into which members can pay a minimum of 500 roubles (just over £5) per month. All members will become one of the club’s founders, can attend general meetings and also see the club’s accounts. It is early days for the new Kuban, but there is a strong sense of public will and professional expertise – as well as love – being behind its quick rebirth. It is not improbable, given this backing, that Kuban will be back in the Professional Football League within two or three seasons. The differing league calendars of amateur and professional football, with the amateur game running all summer, make this even more likely. Things at Urozai are less optimistic. Shortly before its first ever match, main investor Litvak quit following disagreements with the regional administration over the club’s name; general director Aleksey Zinin and manager Vladimir Gazzaev soon followed, along with a number of players. A scanty squad of twelve players were available for the side’s first ever match, though this has been added to since. Has the Premier League scored an own goal with the Transfer Window?